Quick and easy disassembly - Blue and red interchangeable panels. Features a Delta tiller for easier steering for those with arthritis or just want to drive with one hand. E-Wheels EW-36 Mobility Scooter - 2019 Model - Brand New! Features adjustable rear spring suspension and 12" pneumatic tires. For safety purposes, this electric handicap scooter is designed with a four post seat. E-Wheels EW-72 Mobility Scooter - 20189 Model - Brand New! Capably handles up to 400 lbs for long distance trips of up to 35 miles! Full Size 3-Wheel Mobility Scooters have 3 three wheels and allow for easy maneuverability both inside and outside due to their tight turning radius. 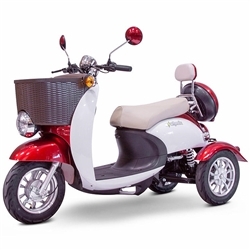 These scooters have higher weight capacities and are larger to allow for more comfort.